On Friday night 20th November, Ashburton Refugees Welcome Group hosted a feast, free of charge and open to all. Local people and guests from Plymouth who are refugees, to share food and time together, and hear a talk from former refugee and activist Saif Ali. About 140 people turned up, the food was abundant and delicious. We heard the voices of refugees : their needs, humour, recipes and more. Refugee journeys do not end upon arriving here: isolation, no local knowledge or networks, can lead to isolation and depression, compounding trauma . A collection for refugee charities raised £750. That night, and since, we felt the love and determination in the room, and saw it in action. Thank you to all those who played a part, large and small in helping the evening take place and succeed beyond all our expectations. Small events like these are happening all around the country. This is how change happens. This is what anyone who wants to do something for refugees can do. Feel the love. Be the change. Pass it on. There is to be a New Year’s eve celebration in Totnes Civic Hall. Between 8.00pm and 9.00pm a group of us will be singing to raise money for refugees. Rehearsals for this will be at 7.00 pm in St Johns church Bridgetown on the 27th and 30th of December. All singers and musicians welcome. We will rehearse 6 songs if time allows. For the first rehearsal on the 27th we will concentrate on learning the words and singing together. At the second we will learn harmonies. If you play an instrument please bring it to both rehearsals. I will provide all the music and words but you could have a look at the youtube clips to help learn the songs before we meet. The 6 songs we will all sing will be…..
All these songs are easy to learn and will involve the audience. There will also be songs by refugees but I don’t know the name of these yet. The Totnes Christmas Tree Festival held at St Mary’s Totnes will be in aid of Beyond Borders Totnes and District. There will be up to 40 trees this year, all representing the many different Charities and Voluntary Groups in our town. The Festival will be launched with a short service of blessing on Tuesday 8th December at 6pm – just in time for Late Night Shopping. It will be open until January 4th. Totnes Citizens UK workshop in Ashprington Village Hall on Tuesday 10th November, 6.30 – 8.30pm. will be held on Monday 26th October 3pm – 6pm in the Upper Gatehouse Meeting Room in the Courtyard, on the Dartington Estate. Everyone who is willing to offer some practical support to refugees and asylum seekers – of whatever kind – is very warmly invited. People will be coming from Plymouth Red Cross to help further understanding of the realities of situations of asylum seekers and refugees, the nature of challenges they face being here – and help us listen more about the specific needs and possibilities that refugees and asylum seekers might welcome – and help us grasp better the long-standing asylum seekers dispersal / reception programme. Will also include an update on the government’s ‘Vulnerable Persons Resettlement Programme’ and how Dartington and other local initatives are working to link into that. The hope is to further collaborative discussions, explore the best ways to move forward, and maybe begin to ‘self-sort’ into groupings around particular offers, interests and ideas. The Exeter University British Red Cross group (EUBRC) are collaborating with the Amnesty International and OXFAM societies to organise a candlelit vigil in quiet reflection upon those who have lost their lives, homes and families in the current European Refugee Crisis. The plan is to walk from the Forum to the Cathedral, each carrying a candle. The event will be introduced by a Syrian refugee and concluded with the poem ‘Refugee Blues’ by W.H. Auden, and at our final destination we will arrange the candles to spell out ‘Refugees Welcome’. The event is open to all. Facebook event entitled Candlelit Vigil in Support of the Refugees if you would like to pay it a visit. Contact Ella Coates on 07860402300 / 01305 214437 for any queries. 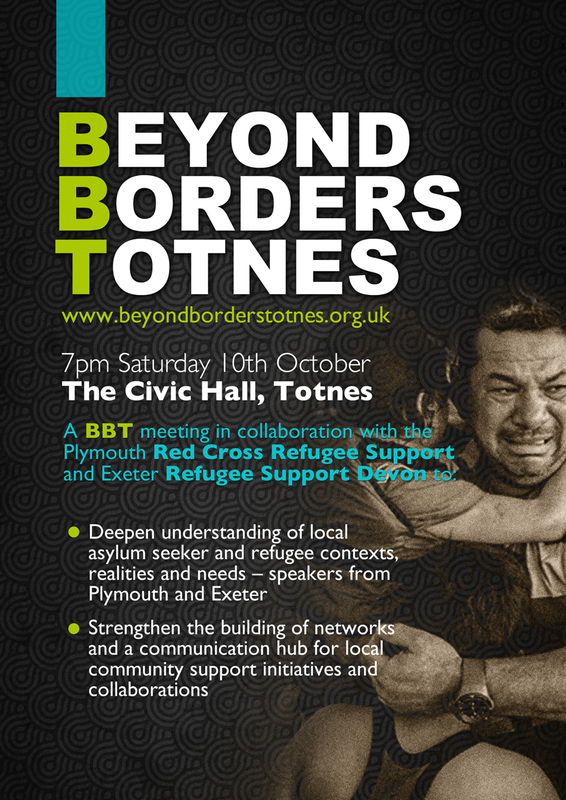 A Beyond Borders Totnes & District meeting in collaboration with the Plymouth Red Cross Refugee Support and Exeter Refugee Support Devon – and with kind support from the Mayor of Totnes Town Council and the Circle of Women Elders.